You can do 2 things with the footer. 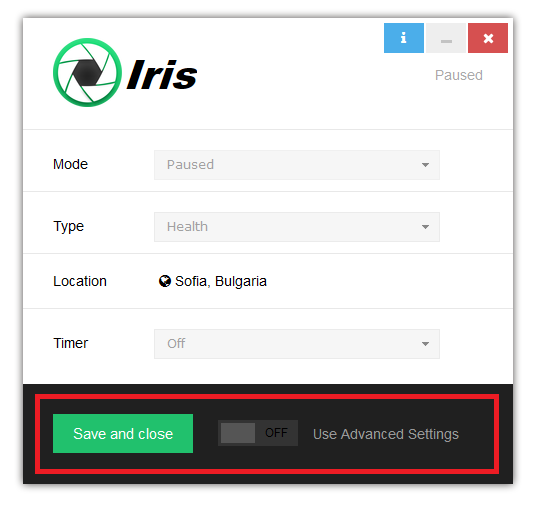 Save and close saves the current settings and sends Iris to the tray. If this checkbox is clicked Advanced view will be shown. 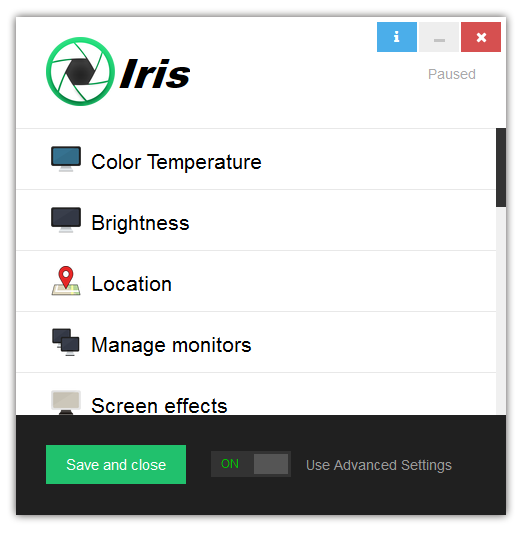 From here you can customize everything in Iris, but you need Iris Pro to enter some pages and customize some settings. Since I don’t want to place ads or to sell user data some features of Iris are paid, but I try to make everybody happy. For most people the modes and types in the Simple view are completely fine. If you want to access the locked sections in the Advanced view you can buy Iris Pro activation code from the Buy page. I forgot my License Number. Please help me. Thank you. I don’t find the ‘ invite friend’ option in the advanced settings. On another note, it’s possible that you are using an older version of Iris. Can you try getting the latest from here and trying again? Is there a quick & easy way to change screens? I cannot open Iris mini after paying and downloading, do I need to uninstall Iris Pro for from the free trial in order to do so, and how do I do this? On the free e-book popup, there is only one option to click, and that’s “no thanks.” How can I get your free e-book? Do I need to buy a new license for each device (IPAD, iphone, 2 computers) that I want to use this on? If I have 2 monitors, will the software work on both monitors at the same time?